Hello, Folks are you keenly waiting for the ESIC Professor Recruitment 2018? So we have good news for those contenders who want to do a work in Employees State Insurance Corporation. Here, we are going to describe complete information related to the ESIC Associate Professor Vacancy 2018. Eligible and capable aspirants must read this article & collect all the vital information from here. 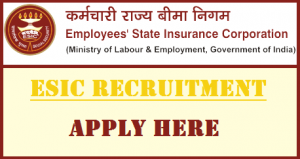 Candidates may apply online for this recruitment from the official website of the Employees State Insurance Corporation which is www.esic.nic.in. For more information, contenders may bookmark our careerjobs360 page & stay connected with us for latest updates. The ESIC-Employees State Insurance Corporation has pronounced the official notification for ESIC Vacancy 2018 for the appointment of capable and eligible contenders for filling up 206 Professor, Assistant & Associate Professor Posts in the department. The Employees State Insurance Corporation is searching for the skilled & deserving contenders for the Professor, Assistant & Associate Professor Empty Posts in the department. Job Seekers, who are seeking for the government jobs in Employees State Insurance Corporation they may apply online for this ESIC Associate Professor Recruitment 2018 from the official portal of the ESIC department. The willing and eligible applicants may apply on or before the deadline date which is 02nd April 2018. For more information regarding the ESIC Assistant Professor Jobs 2018 such as the Academic Qualification, Age Limit, Age Relaxation, Application Fees, Salary Scale, Selection Criteria, Important dates and how to apply online in the below article. We suggested all the aspirants kindly read this information before applying for the recruitment. Academic Qualification: Interested Candidates should have completed Post Graduation Degree/ MS Degree from a recognized Institute or University. For more details, candidates must check the official notification for complete education qualification details. Minimum age limit of the aspirants is 18 years of age and maximum age limit of the aspirants is 56 Year Old. Upper Age relaxation will be applicable for the reserved category of aspirants as per the rules and regulations of the government.. Application Fee: All the candidates must have to pay application form fee as per the category which is mentioned in the below article. Selection Criteria: Selection of the aspirants will be based on their performance in the Personal Interview round which is going to be organized by Employees State Insurance Corporation. For Professor Post: 37400/- to Rs. 67000/- per month along with Grade pay of Rs. 8700/-. For Assistant Professor Post: 15600/- to Rs. 39100/- per month along with Grade pay of Rs. 7600/- Grade Pay. For Associate Professor Post: Rs 15600/- to Rs. 39100/- per month along with Grade pay of 6600/- Grade Pay. Start Date of Application Form: 02nd March 2018. Last Date of Application Form:02nd April 2018. Interested & passionate aspirants can apply online for the ESIC Vacancy 2018 on or before the last date on the official website of the Employees State Insurance Corporation. The contenders can follow the below given steps to apply online for the ESIC Recruitment 2018. First of all, willing aspirants need to open the official portal of the Employees State Insurance Corporation which is www.esic.nic.in. On the homepage go to the notification section and, find out the official notification for the ESIC Professor Recruitment 2018. Save and read the notification very carefully before going for any further procedure. Now, Fill all the asked details in the application form very carefully without making any mistake. Upload the recent passport size photograph & signature and the scanned copies of the required document with the application forms. Remit the fees for the application form if required. At last, take the printout of the application form. Here, we provide all the details about the ESIC Assistant Professor Vacancy 2018 in the above description of the article. All the interested contenders are required to read the official advertisement before applying for the ESIC Professor Recruitment 2018 through the official web portal which is given at the end of this article.